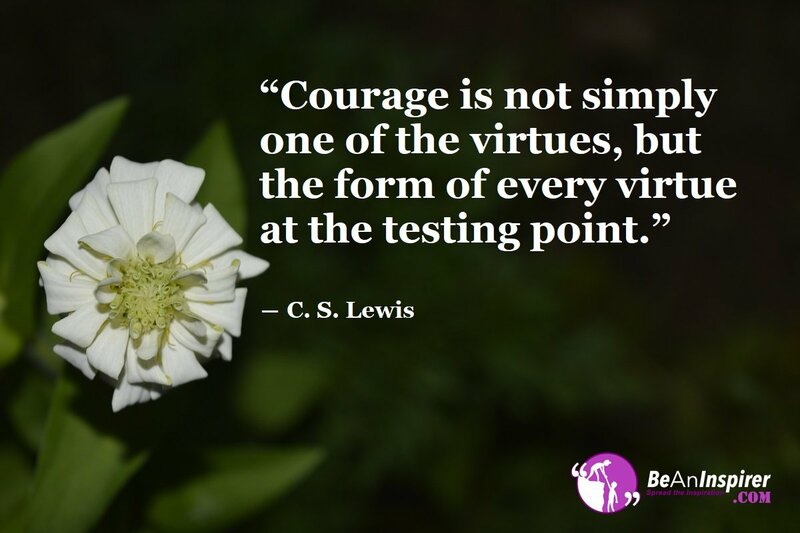 The courage gives power and provides the motivation for us to move forward in any aspect of our lives, especially to face challenges that test our sense of the environment around us, and the way we as individuals perceive our personal capacities, as a way of understanding what is happening around us. If we would fail to be aware of us and our surroundings, then we would end up with bags of bad choices. It is important to know what are the foundations that we can put into practice in order to attract positive energies towards our lives, following the patterns of behavior with which we will achieve a better performance in many aspects of our daily lives and social relationships in general. Courage gives power, the power to understand how to attract positive energies. You may try meditation, yoga, or any other form of self-awareness, self-union program. You have to ‘kill your past’ or at least get rid of continuous past-thoughts. Remember, your past is like a rear mirror of the car (life) that you drive. You can have a glance of the behind (past) through the real mirror. But you should not fix your easy on that, otherwise, an accident is inevitable. You may avoid bad aspects and imbibe good qualities in your life. Start a purposeful living. As courage gives power, you should be courageous enough to get rid of the bad qualities/habits which would otherwise seem ‘very dearer to you’. Throughout the years, society has transcended to understand existential concepts with which to have a pattern of conduct. We as a species have many aspects and characteristics. Courage gives power and is one of the elements with which we can identify and stand out from the rest of society. As we can see, many experts know the theoretical basis for understanding human nature. Both you and I possess virtues that only wait to be awakened by a change of attitude or beginning to generate changes in the way we act and present ourselves to the world. Any kind of opinion and point of view is valid in this regard, but if you want to generate a change in yourself, you must start taking initiative and have the knowledge on how to attract positive energies towards our lives. How Do I Live with this State of Mind? Courage gives power and works like a channel to connect us to a state of greater perspective, that is, with the practice of this, we will be able to open our horizons to know aspects of our life that until now we ignored, but that in the long term will help us to improve the way we face the challenges of life, whether it be getting a higher position in our work, presenting a project at school or even inviting a girl/boy out. Motivation and the effort to generate change is the key to start changing our lives in a positive way, it is simply a question of possessing sufficient willpower and keenness to attract positive energies. Let’s see it as unlocking one more achievement as if it were a victory in a battle that we can win at any time. If we are able to understand the impact that this concept of life provides to our way of being, then we can open our thoughts to solve any problem that comes our way. Remember, you ought to harness the supremacy of valor as courage gives power to you. No matter the size or magnitude of it, we must have the necessary tools to get the right answers, without losing the course of our primary objective and knowing in all matters, how to attract positive energies towards our lives. Share your opinions in the comment box below! We would like to see your views on this topic.